Well I’ve put the shotgun away for the summer and the motorbike has once again been dragged from the warm embrace of the back of the barn – well – it will in time for the MCN Motorcycle Show. I stopped commuting into London when I moved out of town and had to ride down Euston Road and out to the Old Street roundabout every day. I had four near-death experiences on that stretch of road in as many days and decided it was time to hide the bike away for commuting and concentrate on the adventure bit. But reading through the stats it seems I’m in a minority. London has more bikers than Manchester, Birmingham and Newcastle combined. In fact 12 per cent of the total UK bikers are based in London. Which is hardly surprising when you consider the daily grid lock into and out of town. It also turns out that over the last year we’ve been registering more low-powered bikes (50-125cc) than ever before. There were 17 per cent more new, low engine bikes registered in the UK between December 2010 and December 2011. I just hope they’re not all scooters. (not that I have anything against idiot scooter riders you understand). We all know that biking into London is quicker, cheaper and greener than pretty much all other options – so I think it may be time to reconsider that season ticket with Chiltern Railways and get back on the bike. 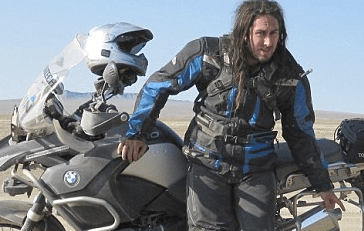 I may even get the gear out in time for the ride from The Ace Cafe on Saturday with Ross Noble and friends in aid of Riders for Health – something you should consider if you’re heading to the show on Saturday. By day he’s the mild-mannered 12-times World Trials Champion, but by night Dougie Lampkin roams the streets in pursuit of an ASBO. This should do it – breaking and entering the ExCeL London where in just a few days he’ll be racing David Knight, John McGuinness, Neil Hodgson, Ian Hutchinson and Chris Walker in our Revolution extreme obstacles enduro challenge, sponsored by Michelin. But will he get past the SAS-trained guard to do the pre-race research he craves? Nothing else to say really… mild-mannered 12-times World Trails Champion? Surely that’s not possible. Take a look at the video to see what I mean. All our videos, now in one place. April 27, 2009 / Matthew Cashmore / Comments Off on All our videos, now in one place. Well it was rather difficult to watch them back on Qik, so we’ve uploaded them all to YouTube and here is the magic player that lets you navigate from the very first video, to the very last. Enjoy 2 hours of three men chatting to a crappy video camera! and here’s the video from our last interview where we got the host to try a heater meal! …. in case by any chance you’re still subscribed to the RSS feed for JTR here are the links for the photos on flckr. I’m sorry it took so long to get them all live. Or you can see Matthew’s Photos, Stace’s Photos, or Patrick’s Photos in separate streams. September 18, 2008 / Matthew Cashmore / Comments Off on Thanks! Well we’ve been back a few days and we’ve finally sorted the washing out. So it seems returning to normal now seems to be the order of the day….. However before we all slip back into everyday life we’d just like to express our thanks to everyone who has supported us on our journey. We’ve all enjoyed the experience and the memories will remain with us for ever and most importantly of all we’ve done a little bit of work to raise awareness (and a bit of cash) for Everyman. That being said we couldn’t have done it without you guys wishing us well from a far. Your messages kept us going on the journey so now sit back and enjoy (once we’ve sorted them all out) the pictures and videos……. Sorry for the lack of video updates but as you can see from the last post we’ve had some issues getting the latest ones live… it’s now fixed though! Latest videos now appearing at the top of the screen – don’t forget we’re doing several a day now (shorter ones!) so click on the ‘qik’ button and make sure you’re up to date with the latest news from the road. Sorry we’ve not been writing quite as much as we’d planned – but internet access doesn’t seem to be as prevalent as expected. But none of that matters! Because we’re in a camp site of our dreams…. the first three we went to today were shut – this one was open – and why is it so fantastic? Because they’ve let us camp in the band stand, and they have wi-fi – and all this for four euros each. We’re now two days behind schedule – tomorrow we should get to St Petersburg – with any luck – and we need it. You’ll know what’s gone wrong if you’re following the videos above (tip – click the ‘qik’ button to watch older videos – we’re now doing more than one a day) but essentially all our problems have meant we’ve had to seriously re-think our plan. So far the plan goes like this…. get to St Petersburg… after that we’re going to see how much money and time is left. The repairs to the bikes have hit the pocket hard as have the enforced stays in hotels – either due to horrendous weather of breakdowns. It’s been two days of conflicting emotions – on one hand – way-hey! Lot’s more people donating to Everyman at JustGiving which is fantastic – in particular I want to mention the partners at Paul Davies and Partners (who Stace work for) who have donated a fantastic £200! Paul Davies and Partners do quite a lot of charity work, and they’re a big company… international architects and are in the top 100 companies to work for – a pretty cool company who’ve given us a pretty cool £200 to stamp out male cancers. The bike has been serviced and all went well until 4pm yesterday when I tried to start the bike… then it was all a bit Arghhhhh! Bike simply refused to start even though there appeared to be sufficient power for lights etc – I went through the alarm, and ignition circuits, checked the fuses – you name it I checked it. In the end I took a gamble and dashed up to Honda in Luton to buy a brand new battery (£49), which also cost me a parking ticket (£65), but when I got home, charged the battery and put it on the bike – all was well and it fired up (priceless). So the time is nearly here. We leave a week Saturday from Hatfield – in fact we’re having a bit of a party and you’re all invited. Details over on the facebook event page. We’re going to meet at around 3pm, and party until we leave at 7pm – there’s a band booked to play and there’ll be shed loads of burgers, rolls, and importantly jelly (it’s not a party without jelly). We’re going to be ‘livecasting’ every night at 7pm BST – right here on this site – you’ll be able to watch a live two minute TV show from where-ever we are on the road – all thanks to the magic of my Nokia N95 and a new service called Qik. If you miss the show, don’t worry the last one will be available all the time right here on the front page. And in exciting BBC News – you’re going to be able to keep up to date with our movements via Up All Night on Five Live – how cool is that? We’re on-air early morning of Saturday 30th September before we leave, then again on the phone on Monday 2nd September (again early morning), Saturday 6th September (early morning), Saturday 12th September (early morning) and finally on Sunday 21st when we come back.